Use Certify Payments to ensure your employees are reimbursed and your vendor invoices are paid in a flash, no matter what currency they use. Say goodbye to forex currency fluctuations and fees with our multiple settlement bank functionality. Enjoy deposits that are fast, global, and secure — whether you're working with one bank or across multiple banks. While conventional ACH tools require payment holds for up to five days, Certify Payments provides multiple funding options which can enable payments to be received within 24 hours. Talk to your Sales Representative about your configuration options. Trust Certify to manage the entire workflow for you, from expense report or invoice creation, to approval workflow, payment approval, and status reporting. 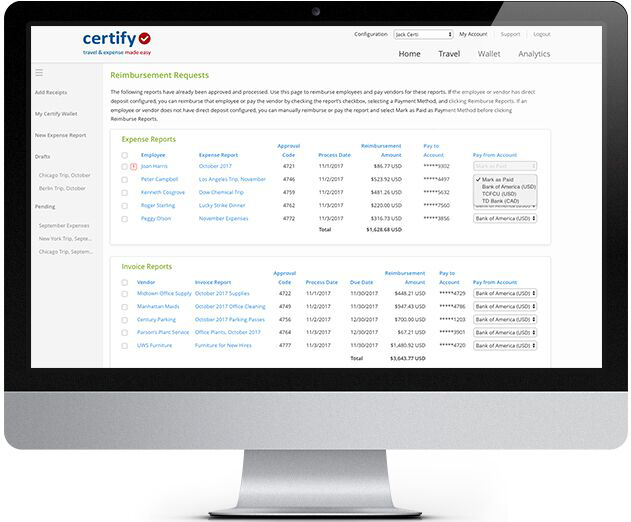 Certify Payments ensures accurate payments following local regulations. Plus, expert support is available for all facets of the process.